I have been making a great chia seed pudding for breakfast lately and it is so good and healthy that I decided it was time to post the recipe. Chia seed pudding is a great gluten-free breakfast option and even better for those who don’t eat dairy but want to have something for breakfast that’s similar in consistency to yogurt. My typical go-to breakfast has been eggs and veggies or a green smoothie but I’ve added this Chia Seed pudding into the mix lately and I’ve been very happy with it. First take the can of coconut milk and pour into a small- medium sized bowl. Then add 1/2 can water and the chia seeds and stir. If you want to add more water you can but too much might make it soupy. Mix in the cinnamon, nutmeg, and vanilla and set aside in the fridge overnight. This makes several servings depending on portion size. What I like to do is make a batch and pour it into mason jars so I can just grab the jar and go in the morning. The chia seed pudding is okay on it’s own but I like to add toppings to it. One of my favorite is blueberries. I will add 2 handfuls to the mix and stir it up. If you are looking for more substance you can add a tbsp of almond butter which is always a good treat. A really good combo is mashing 1/2 banana in there with some almond butter. This is a recipe I’ve learned while doing the whole life challenge (like whole30 but uses a point system and incorporates exercise and overall wellness). I don’t think chia seeds are whole30 compliant but they are whole life approved and have been good to me. They are also a good source of omega 3’s. Enjoy! What about you? Have you ever tried chia seed pudding? Post in the comments and let me know! Yum! I haven’t tried chia seed pudding but I do add chia seeds to anything I bake–granola, cookies, muffins, etc. They are a good addition to any meal for sure. Full of fiber, too! Glad to hear you are feeling better. That sounds delicious! I’m going to have to try that now that I have a new love of coconut milk and chia seeds! Thanks for sharing, and for visiting my blog! 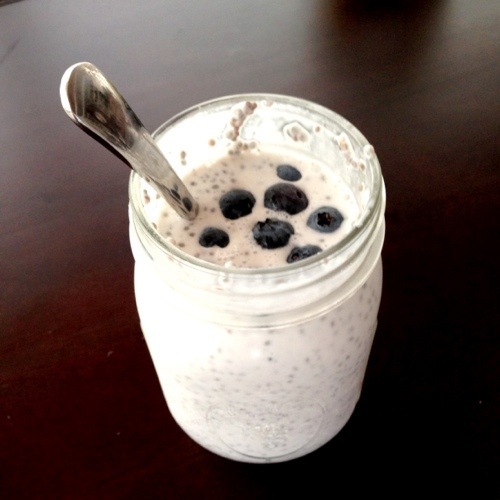 Well if you like chia seeds and coconut milk I think you will really enjoy this recipe! Happy to have found your blog and look forward to keeping up with it!!! This looks great! I’m finishing up my first Whole30 and have just been on straight eggs for breakfast (not that I mind too much). I plan on eating mainly paleo after I finish, so I’ll have to add this to my recipe list! Yeah, I got really bored with eggs after whole30’so I started to make this to mix it up. Congrats on finishing! How are you feeling? I’d like to try this but I’m bit worried about the saturated fat in coconut milk using it on a daily basis. Doesn’t that concern you? If you are still bothered by the amount of fat in coconut milk, try using a light coconut milk. I actually prefer the taste of light coconut milk in chia seed pudding better because it’s not as thick. I just read on the Whole30 forums, as per Melissa herself, chia seeds are not encouraged but not banned during your Whole30. Thanks for the recipe!